It seems like everyone’s drinking coconut water these days. Avid drinkers are touting it as the miracle electrolyte replenishment, a natural performance enhancer, a workout recovery solution, and of course, a hangover cure. But if science has taught us anything, it’s that if it sounds too good to be true, it probably is. So we must ask the question: is coconut water really the enriching elixir it claims to be? Or is it just another fitness trend? We consulted ATLX Expert Dr. John Ivy – a specialist in nutrient timing in athletes, a world-renowned authority on nutrition and exercise performance, and the guy who put chocolate milk on the map for athlete recovery – if coconut water really is all it’s cracked up to be. His answer? Grab a good sports drink instead. “I have not seen that coconut water provides any advantage over a good sports drink for maintaining hydration during exercise or for rehydrating post exercise,” Dr. Ivy explains. Dr. Ivy went on to say that he has seen no evidence that coconut water is as good or better than a sports drink for athletes in terms of recovery. Coconut water in its natural form contains no protein and lacks the sufficient carbohydrate concentration required for training adaptation and the body’s recovery after a workout. Coconut water’s most valuable quality for athletes is the assumed beneficial electrolyte concentration and rehydration capacity. But Dr. Ivy says that’s a misconception. Although coconut water does boast a high electrolyte volume, it’s not the ideal ratio. The human body’s major electrolytes are Sodium, Potassium, Chloride, Calcium, Magnesium, Bicarbonate, Phosphate and Sulfate. While coconut water is high in Potassium, it’s relatively low in Sodium – the major electrolyte lost during exercise. Compared to most sports drinks, coconut water’s ability to replace that sodium just doesn’t stack up. In fact, high consumption could cause more harm than good. “Little potassium is lost during exercise,” Dr. Ivy says. “Taking in high amounts of coconut water could create an imbalance in the normal sodium/potassium ratio.” And further, too much coconut water can actually act as a diuretic and actually cause loss of water. … just a bit detrimental to rehydration, if you ask me. 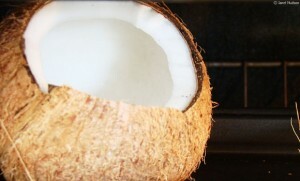 Dr. Ivy notes that coconut water offers beneficial fueling purposes for an athlete before performing light workouts. Its contents are good for a quick boost of energy. But he also notes that, while coconut water does not contain sufficient carbohydrates for recovery, its carb content is still higher than other pre-workout options. – If coconut water is your sports drink of choice, use it in moderation for rehydration – it’s not sufficient for recovery purposes. – It’s likely a good sports drink is better formulated to replace the electrolytes your body will lose during a workout, so grab one of those instead. 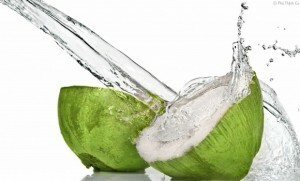 – Keep in mind, coconut water won’t keep you better hydrated than regular water – and, it’s more likely to cause bloating.